Flaunt It! Monday: Why Not Bob Store? Why not Bob? Why not on Tuesday? Yah, I know it’s Tuesday, but we were out of the house almost all day yesterday and when we got home we were doing the tree trimming, holiday decorating, family thing. So, I pretty much didn’t realize it was Monday until about 10pm last night. So, if you don’t tell I won’t either! So, Why Not Bob Store? Bob sells eco-friendly, biodegradable products for your catering and entertaining needs. With the Holidays in full swing and entertaining plans in order you know you will have that guilty need for disposables. I mean do you really want to spend half of Christmas day washing glasses, dishes and utensils from the Christmas Eve bash you threw the night before? We believes it’s time to take the next step by using products made from renewable, plant-based resources, that are petroleum free, non-toxic and require less energy to produce. Compostable products, in the right conditions, turn back to soil in a short period of time. Vegetable starch and sugarcane are eco-friendly alternatives to plastic and tree paper. Since the products are disposable, Eco-Products does not add any toxic or unnatural materials to ensure that the inherent compostability remains. When disposed of properly in a composting facility, the products have a beneficial impact on the environment. I had the opportunity to try out some of the products from the Why Not Bob Store and I was very pleased with the quality. I especially liked the Sugar cane plates. Additionally, the plant starch cutlery was not only nice quality, but I have been able to wash them over and over in the dishwasher and they have held up perfectly! The only downer was that the cold cups warped in the dishwasher, but they hold up fine handwashed. This was my own fault they aren’t meant to hold up to the heat. So why not try products from the Why Not Bob Store? for your holiday parties or other events? The Why Not Bob Store will give one reader a party pack to try out over the holidays! Comment here on what Why Not Bob Store? product would help you green your holidays – or something you learned from their site. Tried a Why Not Bob Store? Product… Let us know what you think. The deadline for entering is Thursday 12/10/09 at 8pm EST at which time one winner will be randomly chosen. Please don’t forget to leave a separate entry and any entries that show obvious laziness i.e. a simple “Thanks for the great giveaway” will not be published therefore not counted. It’s just not fair for the people that do know how to follow simple directions. US residents only. Thanks! So glad you are enjoying the products and thank you so much for providing feedback to my readers! Merry Christmas! Jennifer, I just wanted to let you know that I got the Party Pack Yesterday from the Why Not Bob Store and I am very impressed by how durable the plates are, as well as the cups, cutlery, and bags. I think using disposable dishes that are biodegradable is something that is extremely important to the well being of the Earth, making the products offered by the Why Not Bob Store all the more important. Thanks! Wow. The Why Not Bob Store looks like a great resource. It's the most comprehensive I have found for biodegradable products. I learned that the company is located in Collingdale, Pennsylvania. I learned that “Paper makes up over 40% of our nations landfills. Not only is it important to recycle, but also to buy recycled products to complete the loop!” I agree! Love that these are 100 percent compostable alternative to plastic disposables, PLA (polylactic acid, or biopolymer), is a vegetable-based product produced by NatureWorks®. I like the rectangle deli containers. Thanks for the chance. I hate plastic, so I liked that PLA is a vegetable-based product. Perfect! These would really help this holiday season because all we use is diposable plates for our get togethers. It is great to know that if you are going to add to your garbage pile it will at least biodegradable and not sit in a landfill for hundreds of years to come. Biodegradable plates are a step in the right direction. I also like that they contain no petroleum. We go through a lot of cups at the holidays so using the 16 oz. Corn Cup w/ Green Stripe would help us green up. I like the Rectangular Deli Containers. 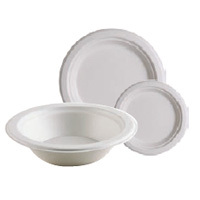 The 8″x8″x3″ sugarcane clamshells would be perfect to distribute leftovers this party season. We use so many plastic bags at the moment it's shameful! 100 percent compostable alternative to plastic disposables, PLA (polylactic acid, or biopolymer), is a vegetable-based product produced by NatureWorks®. These items are the perfect choice to minimize a business's or household’s impact on the environment — didn't know there was a good plastic – great! Wow. a disposable plate that's green, but won't collapse and dump your food on your lap. Sounds great. I expected the priecs to go wya up, but the prices are really pretty good. I think it's great that these products are renewable and green. It's wonderful that Bob's is offering products that are green. Thanks so much. Wow, I did not know there was a company that sold disposable plates and such that were actually not 100% bad for the environment. I always figured that most of the time, if you wanted anything other than the basic paper plates, you were going to have to use something like Styrofoam. .-= Steve@Lift Chairs´s last blog ..Treating Rheumatoid Arthritis: Monitoring the Effects of the Disease =-.